Safety • FDA says labels aren't needed on GMOs; Vermont becomes first state to require them. Washington • Genetically modified foods have been around for years, but most Americans have no idea if they are eating them. The Food and Drug Administration says they don&apos;t need to be labeled, so the state of Vermont has moved forward on its own. On Thursday, Gov. Peter Shumlin signed legislation making his state the first to require labeling of genetically modified organisms, or GMOs. What about the rest of the country? And does labeling matter? There&apos;s a lot of confusion about genetically modified foods and their safety. Some people feel very strongly about GMOs. Opponents, who at times have protested in the streets, say consumers have the right to know whether their food contains GMOs. The Vermont law is their first major victory. The food industry and companies that genetically engineer seeds have pushed back against the labeling laws, saying GMOs are safe and labels would be misleading. "It&apos;s really polarizing," says New York University&apos;s Marion Nestle, a professor of nutrition and food studies. "There&apos;s no middle ground." What they are • GMOs are not really a "thing," Nestle says, and that&apos;s hard for the average consumer to grasp. You can&apos;t touch or feel a GMO. Genetically modified foods are plants or animals that have had genes copied from other plants or animals inserted into their DNA. It&apos;s not a new idea  humans have been tinkering with genes for centuries through selective breeding. Think dogs bred to be more docile pets, cattle bred to be beefier or tomatoes bred to be sweeter. Turkeys were bred to have bigger breasts  better for Thanksgiving dinner. What&apos;s different about genetically modified or engineered foods is that the manipulation is done in a lab. Engineers don&apos;t need to wait for nature to produce a desired gene; they speed up the process by transferring a gene from one plant or animal to another. What are the desired traits? Most of the nation&apos;s corn and soybeans are genetically engineered to resist pests and herbicides. A papaya in Hawaii is modified to resist a virus. The FDA is considering an application from a Massachusetts company to approve a genetically engineered salmon that would grow faster than traditional salmon. In your grocery cart • Most of the genetically modified corn and soybeans are used in cattle feed, or are made into ingredients like corn oil, corn starch, high fructose corn syrup or soybean oil. Even in some of those products, the manufacturing process itself may eventually remove some of the modified genes. A few fruits and vegetables are engineered  the Hawaiian papaya and some squash and zucchini, for example. Only a small amount of sweet corn, the corn we eat, is genetically modified. But there&apos;s no genetically modified meat or fish, like the fast-growing salmon, currently in the market for human consumption; the Food and Drug Administration has yet to approve any. The risks • The vast majority of scientific research has found genetically engineered foods to be generally safe. An Italian scientist&apos;s review of 10 years of research, published in 2013, concluded that the scientific research conducted so far has not detected "any significant hazard directly connected with the use of GM crops." One French research team raised safety questions, but their much-criticized 2012 study linking genetically modified corn to rat tumors was retracted in 2013 by the scientific publisher, who cited weak evidence supporting the conclusions. Even the food police say they are safe: The Center for Science in the Public Interest, a well-known critic of food companies and artificial and unhealthy ingredients in foods, has not opposed genetically modified foods, on the basis that there&apos;s no evidence they are harmful. Though what we are eating now appears safe, the main concerns for the future would be new genetically engineered foods  from the United States or abroad  that somehow become allergenic or toxic through the engineering process. The FDA says the foods they have evaluated to this point have not been any more likely to cause an allergic or toxic reaction than foods from traditionally bred plants. Unlike animals, the FDA is not required to approve genetically engineered crops for consumption. However, most companies will go through a voluntary safety review process with FDA before they put them on the market. The benefits • There are clear benefits for the agricultural industry  the crops that are engineered to ward off pests or to tolerate herbicides, for example. And companies like Monsanto that produce modified seeds say their technologies will be needed to feed a rising world population as they engineer crops to adapt to certain climates and terrains. While most modified foods have so far been grown to resist chemicals, pests or disease, advocates envision engineering crops to make them more nutritious as well. Food animals have been engineered to be bred to be free of diseases, be cleaner in their environments or grow more efficiently, though none has yet been approved in the United States. The politics • There is an escalating political fight between the labeling advocates and the food industry, which has dug in against labeling. In the absence of a federal labeling standard, GMO opponents have gone to the states to try to get a patchwork of labeling laws approved  a move that could eventually force a national standard. Ballot measures in California and Washington state failed, but the legislative effort prevailed in Vermont. Maine and Connecticut also have passed laws requiring labels, but they don&apos;t take effect unless other states follow suit. 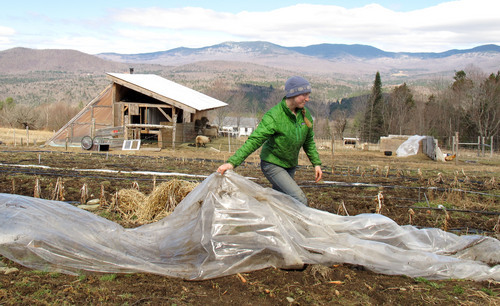 The food industry is widely expected to challenge the Vermont law in court. The state efforts aren&apos;t slowing down. According to the National Conference of State Legislatures, there are 85 pending GMO labeling bills in 29 states. In Congress, the food industry is pushing a House bill that would head off efforts to enact mandatory labeling of genetically modified ingredients by proposing new voluntary labels nationwide  an attempted end run around the state-by-state laws. The future • Safe or not, consumers are increasingly interested in what is in their food, including GMOs. "There&apos;s so much confusing speech on food packaging and food advertising that consumers are often buying things they think are GMO free when they are not," says Scott Faber of the Environmental Working Group, which is pushing for the labels. Faber and other labeling proponents say it&apos;s about transparency, not technology. They say there is precedent, like orange juice labels that say whether the juice is from concentrate.